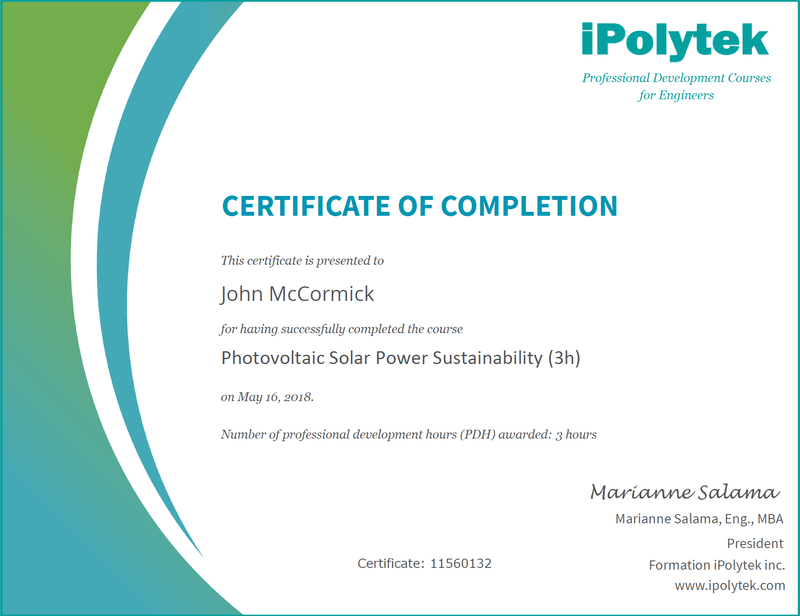 This professional development course on the sustainability of photovoltaic solar power examines its energy payback time, emissions, land usage and recycling potential. Photovoltaic Solar Power: How green is it? In 2016, photovoltaic solar power accounted for 1.5% of the world’s electricity production. The German Advisory Council on Global Change predicts that by 2100 the sun will supply more than 50% of the world's energy. With such growth on the horizon, a rigorous assessment of the environmental impacts of this technology has become necessary. Solar Impulse is the first solar-powered aircraft to complete a round-the-world trip powered only by the sun, using no fuel, causing no polluting emissions and even flying at night. On July 3rd, 2015, Solar Impulse concluded a record-breaking solo flight of 5 days and 5 nights without fuel from Nagoya, Japan to Hawaii, USA. The goal of this ongoing project is to promote energy efficiency and the use of renewable energies to protect our quality of life. How clean is solar power? The role solar PV is expected to play in the global energy mix of the future. What solar panels are made of and how they are manufactured. In terms of Energy Payback Time (EPBT), greenhouse gas emissions, sulphur oxides (SOx) and nitrogen oxides (NOx) emissions, heavy metals emissions, water usage and land usage. How decommissioned solar panels can be recycled. Learn about solar power sustainability and accumulate professional development hours at your convenience. Access this course from any computer or mobile device and take up to 2 years to complete it. Instantly download your course completion certificate attesting that you have earned 3 professional development hours (3 PDH). The Complete PV Solar Power Course Bundle includes two courses: Solar Energy and Photovoltaic Solar Power Sustainability. Buy these courses together and save 15%. Sign in to download this course in PDF format for FREE! Want to try out this course on our platform? Gain access to the first two sections of this course and download the complete course notes for FREE by clicking the button below. 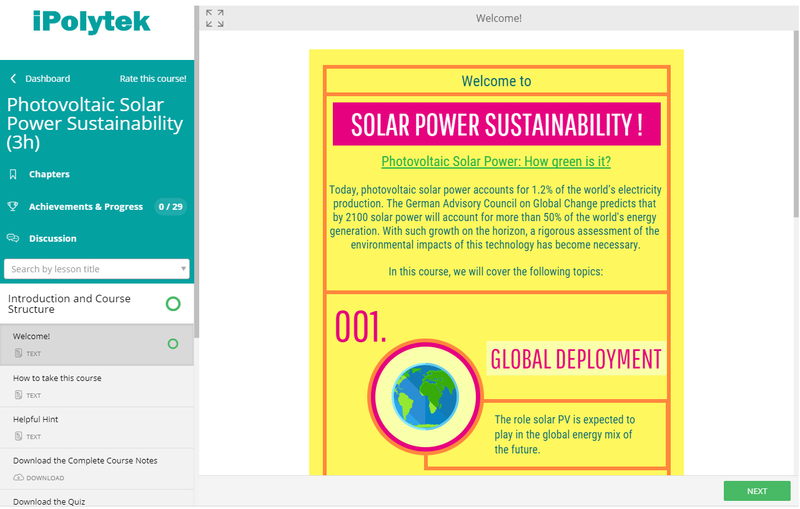 At the end of the free preview, you will have the option to access the full course. Only if you chose to upgrade to the full course will you be asked to enter your credit card information. 3 hours, Attention Canadians: WE PAY THE TAXES! Instant, 24/7 access to this course for 2 years. Use your computer, telephone or mobile device. The entire course in PDF format. A course completion certificate attesting the number of professional development hours (PDH) mentioned in the title of this course. Preview the first two sections of this course absolutely free. Download the course notes and keep them even if you decide not to buy. You will not be asked to enter any credit card information. This course has been written to meet the professional development requirements defined by the orders of engineers of the following Canadian provinces and territories and the engineering boards of the following US states. These governing bodies do not require pre-approval of courses or course providers. For more information on the continuing education requirements set forth by your order or board, please click on your province or state below. * These states do not have a professional development policy at this time. It remains the engineer’s responsibility to determine whether an activity meets the guidelines set by their licensing body. It is also the engineer's responsibility to maintain and submit records of professional development activities to their engineering board. Marianne is the president and founder of iPolytek, a company whose mission is to provide training on the latest developments in engineering and relate these innovations to the most pressing issues of our time: climate change, water quality, air quality, and sustainability. Marianne is a chemical engineer with over 18 years of experience in the field of air and water treatment using ozone. She has worked for high-tech companies on the leading edge of their fields, namely, Ozomax, CAE and IBM. She is a graduate of McGill University (B.Eng.) and holds a Masters in Business Administration (MBA) from the John Molson School of Business. A member of the Order of Engineers of Quebec (OIQ), Marianne writes about a variety of subjects, including environmental technologies, renewable resources, and the energy transition. " For me, engineering is about making the world a better place: one idea, one design, one project at a time. "